Our baptism into Christ and the Church is an invitation to sainthood! Think about it. The saints of our Catholic faith are really stories of everyday people who became extraordinary disciples and missionaries. 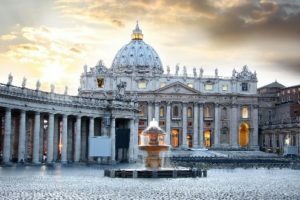 Our pilgrimage to Italy will highlight the holy men and women who overcame sin and personal challenges to bring the Good News of Jesus to the world. Together we will pray, sing, savor gelato, and discern how the Holy Spirit is calling us to be better stewards of God’s gracious gifts with our families and faith communities. Our adventure of discernment begins with an overnight flight to Rome. On board we call to mind the intentions we carry with us and invite the Holy Spirit to guide our steps. Meals and beverages are served in flight. Day 2: Rome, The Eternal City! 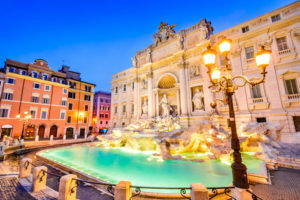 Upon arrival in Rome, we meet our Pathfinders Tour Manager and enjoy a panoramic tour including the Spanish Steps, Piazza Navona, and the Trevi Fountain. After celebrating Mass, we check into our hotel and enjoy dinner at a local osteria. Overnight Rome. “Roma, Roma non basta una vita! 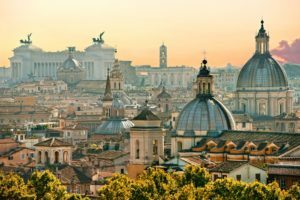 (Rome, Rome, one lifetime is not enough!) After breakfast we anchor our pilgrimage with an understanding of ancient Roman life. 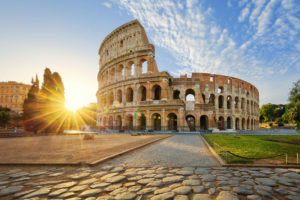 We visit the Colosseum (70-80 AD) and the Mamertine Prison where St. Peter and St. Paul were held before their execution. Next, we follow the Appian Way and visit the Catacombs of St. Calixtus for a rare glimpse into ancient Christianity and celebrate Mass together. Dinner in local osteria. Overnight Rome. 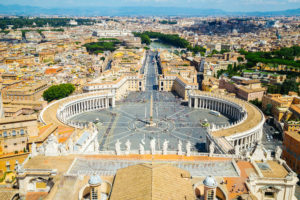 Following breakfast, we enjoy a guided tour of the Vatican Museums and Sistine Chapel followed by an afternoon of leisure to explore Piazza Navona, Castel Sant Angelo, and the Pantheon in small groups. Before dinner we gather at the Pontifical North American College for Mass, dialogue with seminarians, and enjoy the rooftop view of Roma. Dinner in a local osteria. Overnight in Rome. 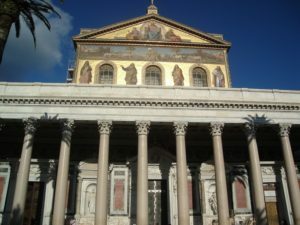 Today we reflect on the lives and witness of the great saints in our Catholic story as we enjoy guided tours and time for prayer at the Basilica of St. Mary Maggiore, the largest Marian church in Rome, and the Basilica of St. Paul Outside the Walls, the world’s 10th largest church. We gather for dinner in a local osteria and an evening stroll for gelato with our small groups. Overnight Rome. Today we rise early for breakfast and a drive through the Umbria region to mystical Assisi. As we remember all the faithful departed, the life and spirit of St. Francis and St. Clare will inspire us. Following a walking tour of the Basilica of St. Francis and the Church of St. Clare, we will enjoy lunch and then meet +Archbishop Domenico Sorrentino at the Shrine of the Renunciation at the Basilica of St. Mary of the Angels for Mass and catechesis on nurturing family life! 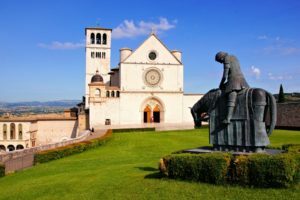 As we leave Assisi we stop at the Basilica of Santa Maria degli Angeli to pray in the Porziuncola of St. Francis: “Lord, help us to listen to the ‘tug’ of your Holy Spirit. We offer you our lives, our gifts, our strengths. Use them for Your glory. Amen.” Dinner in the Eternal City. Overnight Rome. How RARE it is to have an entire day for yourself to pause, listen to the Holy Spirit, revisit your favorite piazza, and savor a final gelato! Today is YOUR day to reflect on the holy sites, prayer experiences, and the “tug” of the Spirit on this journey of faith. How is God calling you to use your gifts and strengths? Is it time to heal old wounds and open a new door in your life? This evening we gather for a vigil Mass and Farewell Dinner to share insights of this wonderful pilgrimage.